Have you been bummed about your favorite natural deodorant brands being bought up by big corporations? On the one hand, it’s nice to see big personal care brands paying attention to market demands for natural alternatives. But…you can’t help but worry that the products you used to love are going to end up being compromised. Can you relate? 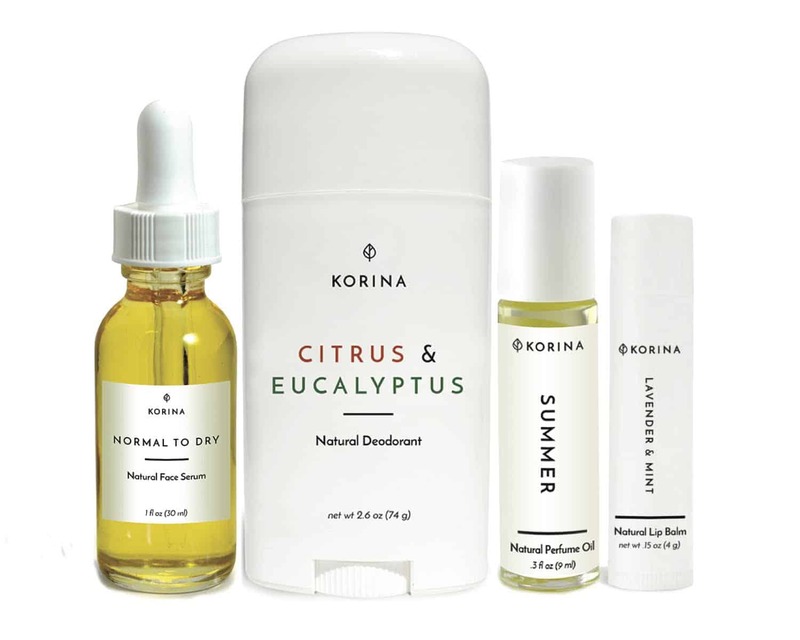 Well, here’s a new-to-me deodorant brand that I’ve been loving lately – Korina Naturals. If you’re seeking a natural deodorant to replace your former fave, you don’t need to look any further because Korina Naturals deo is legit. So far, I’ve tried the Citrus & Eucalyptus scent and it’s fantastic—the blend of bergamot, sweet orange, lemon and grapefruit essential oils is great for perking me up in the morning. There’s also Lavender, Cedar & Tea Tree, BLACK (made with activated charcoal), and Unscented. Needless to say, all of Korina Naturals’ deodorants are free of aluminum and artificial fragrances. Instead, they use baking soda and arrowroot powder to absorb wetness and essential oils to fight odors. Each stick of deodorant is handmade with love in San Francisco. And did I mention that they actually work? Because: that! They do! Korina Naturals also has a line of amazing skincare products (I love their serums! ), lip balms, fragrances and body products that you need to check out ASAP. But today, we’re teaming up with them to give one of our readers a stick of each of their deodorant scents—that’s five sticks total! Enter using the form below. Good luck! If you’re looking to have a skin detox in your underarms, then you should go for natural charcoal deodorants. The armpits are liable to accumulate toxins over time, especially if you’ve been using commercial deodorants that come with lots of chemicals dangerous to the skin. The natural charcoal deodorant will help pull out these toxins and leave your armpits free from dirt. Visit my blog http://charcoaldeodorant.org in order to get more versed with charcoal deodorants. I like the Natural Lip Balm – Orange. I would like to try Natural Face Serum – Normal to Dry. I would like to try the Natural Face Serum. I need some good facial products. I would like to try the Natural Face Serum – Normal to Dry. I would love to try the Green clay mask. I definitely need to clarify. I would love to try the Natural Lip Balm – Orange the most.. I would love to try the Moroccan Red Mask Powder. I would like to try the Natural Deodorant-Black. I’d like to try the Whipped Body Butter – Jasmine & Sandalwood. I would most like to try the cinnamon and mint natural lip balm. The Jasmine & Lavender perfume oil sounds divine! I’d love the citrus and eucalyptus deodorant. I love all citrus scents! The cinnamon and mint lip balm! I’d like to smell Bath Soak – Lavender & Eucalyptus on my wife! I think I’d also like to try their orange lip balm. I like their “Natural Lip Balm – Cinnamon & Mint”. Thanks and God Bless! The Orange and Peppermint Natural Lip Balm sounds good! Thank you!! Natural Face Serum – Normal to Dry! I would like to try out the Bath Soak – Lavender & Eucalyptus. I would like to try the rose and geranium bath soak. Bath Soak – Rose & Geranium looks soothing! I would love to try the charcoal mask powder! I would like to try the natural lip balm-lavender and mint. The natural lavender deodorant or any of the citrusy scents. I am trying several brands of natural deodorant and my current lavender does not seem to do the trick for me. :( love the scent and texture but I must be too high energy or something for the lady-like blend! ha! I’d love to try the Summer Natural Perfume Oil. Natural Lip Balm – Orange & Peppermint. I would love to try all of their products really! I really want to get to the point where all of our products are natural or organic. I tried the Tom’s natural deodorant recently and had to trash it. The texture was excellent, but the product was awful. It actually made the issue WORSE. So trying a natural deodorant that actually works would be so wonderful! I would like to try most the Natural Lip Balm – Orange! I would most like to try the Whipped Body Butter. I love the smell of jasmine and sandalwood. I’d like to try the French Green Clay Mask Powder. I love clay masks. I would want to try any of the natural fragrances. The each sound lovely. I would love to try the Perfume Oil – Neroli & Vetiver. -I would like to try the whipped body butter. I would like to try the French Green Clay Mask Powder – Clarify. I would love to try the Moroccan Red Mask Powder – Sensitive. Citrus & Eucalyptus, love that combo! i want to try the face serum normal to dry. i would love to see what it does to my face. Other then the deodorant one of the other products I would like to try is the Natural Perfume Oil – Neroli & Vetiver. I would love to try the Natural Lip Balm – Cinnamon & Mint. I would love to try their charcoal mask powder. They have such a nice array of products. I would love to try the Moroccan Red Mask Powder – Sensitive as well! I’d love to try their natural deodorant. All of the scents sound divine but I’ve always loved Lavender deodorants. Another Korina Naturals product I would like to try is their Natural Face Serum – Oily or Acne Prone. All of the products look amazing! I am always so happy when I find natural products :) Usually, I can’t afford them though. I think it’s better to save up money and buy something really good instead of buying tons of cheap things! I would love to try the Morroccan Powder Mask! Would like to try the Charcoal Mask Powder Purifying. I would like to try their “Natural Face Serum – Oily or Acne Prone”. I would like to try the Cinnamon & Mint Natural Lip Balm. I would like to try the Lavender & Eucalyptus Bath Soak – sounds heavenly. I would like to try the Jasmine and Sandalwood perfume oil. Thanks for the giveaway! I have actually been on the lookout for a natural deoderant, one without nasty chemicals and additives like aluminium. Korina Naturals sounds like just the thing I’ve been looking for! I’d love to try either of the scented varieties – the Citrus and Eucalyptus one sounds especially divine! I also love the sound of the Korina Naturals facial serums – normal to dry for me! I’d love to try the perfume oils! It’s so so hard to find a natural perfume, so I’ve just been without. But the ylang, lavender and sandalwood sounds DIVINE. So many good products to try. First I would love to try the Bath Soak – Lavender & Eucalyptus. I’d like to try the Citrus and Eucalyptus Deodorant! I would like to try the Bath Soak – Rose & Geranium. I would like to try the natural deodorant. would love to try the all natural lip balm. i cant find a nice all natural lip balm maybe this would be the one ! I’d like to try the Natural Lip Balm – Orange. I would like to try the Natural Lip Balm – Lavender & Lemon. I would like to try the natural face serum! I would like to try the French Green Clay Mask Powder – Clarify from Korina Naturals. I’d love to try the Citrus & Eucalyptus. I would love to try the lavendar and mint natural lip balm. I most want to try the whipped Body Butter in Jasmine & Sandalwood. Would like to try this . I would love to try the Natural Face Serum – Oily or Acne Prone! I would love to try the Natural Face Serum for normal to dry skin. I would love to use the Natural Face Serum – Normal to Dry. The cedar deodorant sounds amazing. I’d most like to try Natural Lip Balm – Orange. I really want to try this deodorant! Their products look wonderful. I want to try the Moroccan Red Mask Powder the most! Love that their masks are in powder form. 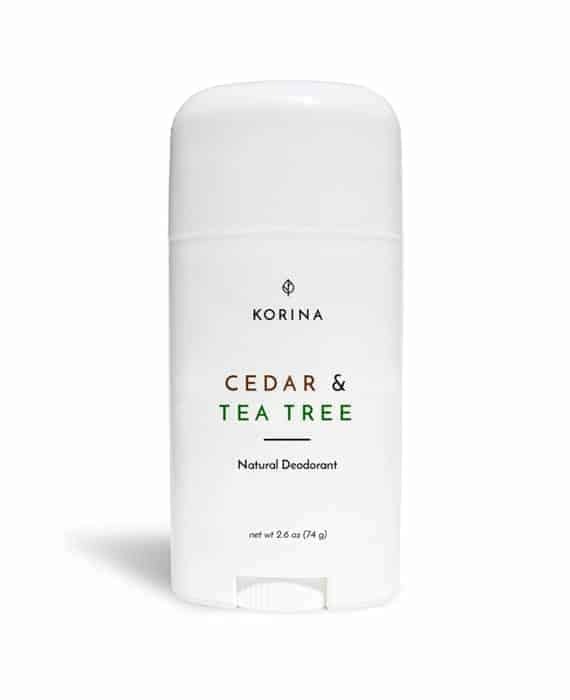 The Cedar and Tea Tree deodorant sounds like it smells amazing! I love anything fresh and woodsy and am on the hunt for the best natural deodorant. I would like to try the lavender deodorant and the unscented deodorant. I would love to try the Natural Face Serum – Normal to Dry. I’d most like to try the Moroccan Red Mask Powder for sensitive skin. I would love to try the Citrus and Eucalyptus scent — it sounds wonderful! I would love to try this line. The scents sound yummy. I would love to try this deodorant — it’s tough to find a natural alternative that really works! I would love to try their Geranium Body Polish for some major exfoliation! I’m really interested in their facial serum! I’m always looking for the best all natural deodorant without baking soda, because generally I’m allergic. I may have success with this product. I would most like to try the lavender natural deodorant.